I simply want the benediction, like Arjuna, to fight for Krishna to the last breath. It seems that every time Prabhupada holds a big initiation, he becomes afflicted with some type of physical ailment. He now has a heavy cold which is worsening. It was bad enough today to warrant him deciding not to have his usual massage with oils. Instead he had me give him a dry one so that he would not have to take a bath. He prepared to depart from the temple by 6:00 p.m. for the evening flight to London. His GBC and senior men, however, came to petition him to remain in New York and rest until he got his health back. Some suggested that he retire from all travel and engagements for a few months. They said that even the airlines advise against traveling with a cold. Air conditioning and pressurized cabins have adverse effects, especially on the ears, which become blocked during descent. Having a cold makes it difficult to clear them, and the pressurization brings dizziness and sometimes air-sickness. But His Divine Grace politely shrugged aside all their suggestions as he waited by the elevator door. He stepped inside, surrounded by as many sannyasis and GBC men that could fit in with him, and began the descent. He turned to them and said with complete clarity and gravity, "I simply want the benediction, like Arjuna, to fight for Krishna to the last breath." He said it with such deep conviction that we all fell utterly silent in appreciation of his full surrender to the Lord and the great sacrifice he continues to make in the service of Krishna, for our and the world's benefit. 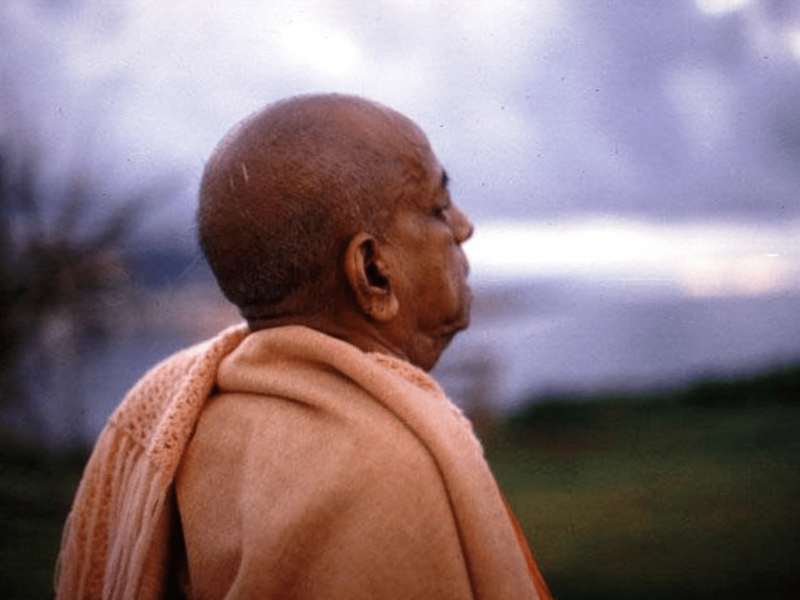 As he exited through the front entrance, Prabhupada turned to Tamal Krishna Goswami, Adi-kesava Swami and the other temple managers and told them, "Now we have this building the Deities must never be moved again." Our party is reduced once more to Pradyumna, his wife and child, and myself. Palika's tenure is over, and when we arrive in England Harikesa Swami will resume his former cooking duties. Visakha and Rakshana's assignments were for North America only. Gurudasa Swami has received an invitation to preach in England, and so he is coming with us. Srutadeva dasa and his family from Baltimore are taking up a new service in England and are also joining our flight. Scores of devotees accompanied Prabhupada to the airport, holding kirtana and remaining with him until the last moment at the boarding gate. At 8:00 p.m. we departed New York for London.